Networking events, today as always, are a great way to meet new contacts, potential clients, suppliers and generally spread the word about your business. Everyone has a plan for these and each tries to get as much out of it as possible. Using social media you can extend the effect of the networking. For example, by spreading the word on Twitter. If you are running an event, set it a hashtag, which you will use on an ongoing basis. This is easily searchable on Twitter and allows attendees to have conversations during and after the event. It also enables non-attendees to find out the latest news and keep up with the event by using social media. You can even prepare a Twitter wall whilst speakers are presenting. Check out tweetwallpro.com. This way you can use social media as a way for attendees to ask questions while the speaker is on stage. Encourage everyone to say who they have met at the event and to follow each other. With each tweet that is sent, everyone should include the event hashtag and the Twitter handle of the business or person they have met. Once the event is over, people can continue to converse and talk about how they enjoyed the networking; they can share insights into what they learned and potentially build their social following. An example of how this can be used was at the Grow for It event we attended last week. 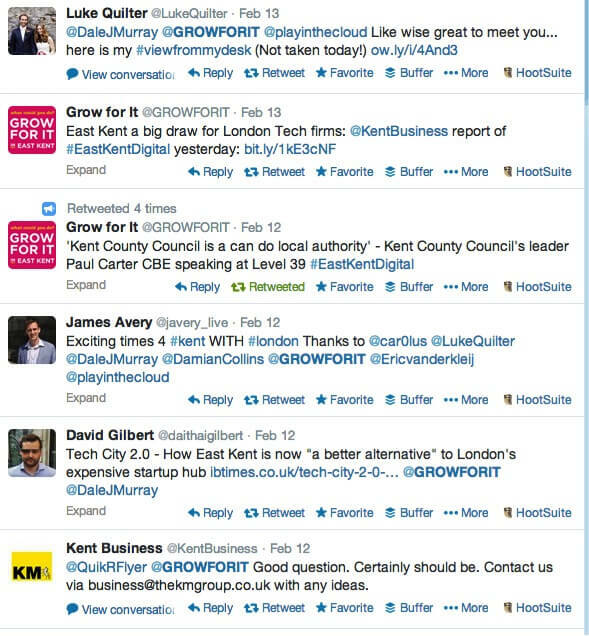 Twitter activity was encouraged and they used #eastkentdigital as a common hashtag and their Twitter handle @GROWFORIT. As you can see from this example, the event organisers, businesses attending, speakers and even the local press were all interacting and continued conversations they had during the event long after everyone had gone back to their respective offices. This is a great way to expand on what is already a proven strategy for meeting people. You may make contact with people and businesses you wouldn’t normally get a chance to speak to and increase your following and contacts further than you would have without social. Additionally, when people search for the event in the future then you will appear in those searches, potentially extending the reach of your tweets and social interaction. If you follow the companies and individuals you met and conversed with at the event, and they reciprocate, both parties will be able to see the social media marketing activity ongoing. This means you will stay top of mind for when they may need your services, without you having to rely solely on more traditional ways, which can be time consuming. Social media should be an integral part of your marketing these days and should be included in more activity as you go. Including this kind of activity into your social planning helps to have relevant conversations with contacts and followers, giving you natural topics and saving you time on having to plan what to say.